Keep your eyes on the pies! There’s just something about a perfectly cooked pie that gets me feeling weak at the knees. The buttery pastry, the hearty filling combined with the richness of the gravy…mmmm salivating as I write, just thinking about it. Where do I go for this ultimate pie fix? 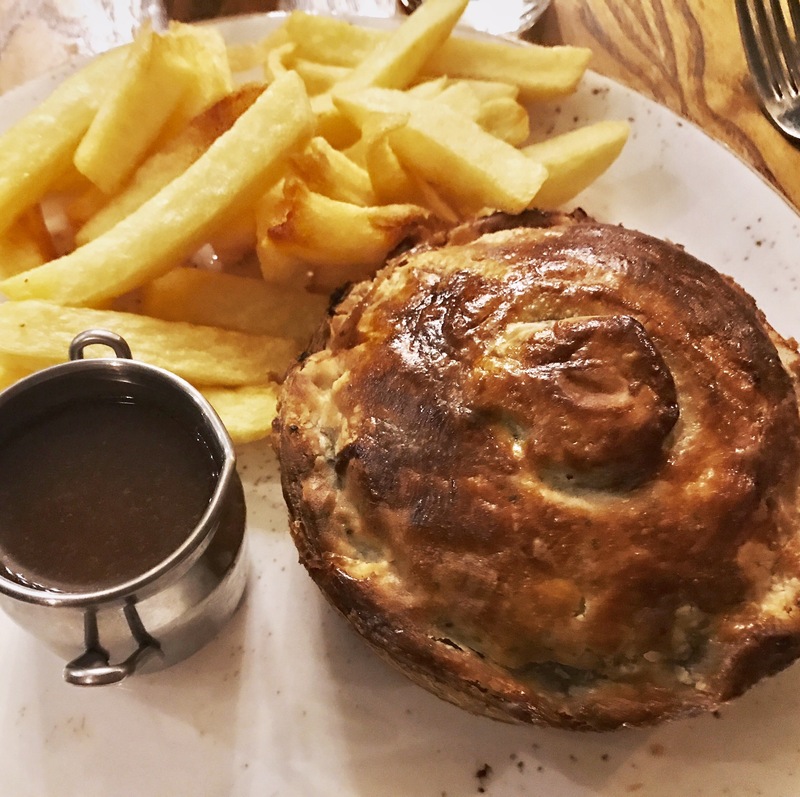 Tucked away behind the hustle and bustle of Regent Street is The Windmill – a pub on the outskirts of Mayfair that’s renowned for their award-winning pies….the best I’ve had in London, without a doubt! Walk up to the cozy pie room where you’ll be treated with polite and friendly service (at a cost) in intimate surroundings or save yourself the service charge and choose a table downstairs by placing your order at the bar instead – entirely up to you. There’s a great selection of pies ranging from your traditional steak & kidney, lamb, fish, chicken and veggie – whatever floats your boat! I opted for the steak and mushroom with a side of rustic chips and gravy this time. Let me tell you, these guys have mastered the art of pie making – it’s no wonder they’ve won numerous awards. Let’s start by pointing out the entire pie is fully encased in a beautiful shell of crisp golden pastry, exactly what I expect from a pie – none of this pot pie with only a pastry lid business you find in other places. The use of suet in the pastry makes it unbelievably sumptuous – not one for those watching their waisteline! Succulent chunks of steak and mushroom merged together to form the generous savoury filling….with a deliciously rich pot of gravy on the side for added measure. Now that’s comfort food at its best! Slightly on the exxy side (it is technically in Mayfair after all) but sure as hell worth it. A pie with a choice of chips or mash, a side of gravy and a drink will set you back £25 but given the quality, you won’t feel cheated – a pie lover’s dream! Excuse me while I wipe the drool off my chin. Señor Ceviche – a Peruvian treat!